This is a guest post by Catherine Maybrey, PhD CDP. Catherine owns and operates CM Coaching Services. After completing her PhD in history in 2005, she experienced the joys and frustrations of retraining, and changing career paths from academia to career development. With 10 years’ experience in the field, Catherine has worked at and with organizations and universities in Canada and the U.S., and with individual clients to deliver high quality, customized coaching programs and career services. At the end of March, labour ministers from the G7 nations met for two days to discuss disruptions to the global workforce, also known as the “gig” economy. The internet and technological advances have certainly changed the way that we work, the type of work that we do, and even where and when we do it. Technology is only a small part of the massive changes heading our way. Automation, which includes software, is expected to affect 15 percent of the global workforce. The greatest concern is contract employment, which some studies estimate will impact up to 40 percent of the global workforce. For PhDs, the idea of precarious employment is not a new concept. It is a decision that every new graduate faces. Should I take a postdoc and delay my job search? Should I teach those courses and enter the ranks of sessional instructors, hoping for something more permanent? Academia has, in effect, been a sort of test market for the gig economy, and the picture isn’t pretty. The issue of contract employment in higher education is characterized by labour actions, ongoing arguments, and calls for reform by sessional instructors and students. Yet the practice of hiring expensive teaching staff on low-paying contracts remains good for the bottom line in the short term, and isn’t likely to change anytime soon. Academia, however, is not the only player in the contract game. For graduate students expecting a more stable future outside of higher education, employment and hiring predictions may be shocking and disheartening, with precarity taking centre stage. If up to 40 percent of the global workforce will be scrambling from one contract to the next, is it still worth it to leave academia? Absolutely! Let’s look at the flipside of this equation. Forty percent of employees in the near future may be contractual, but that means that 60 percent of employees will be continuing. If 60 percent of PhDs, across disciplines, secured tenure track positions each year, then we wouldn’t be discussing the academic hiring crisis. Take it one step further, and consider that some disciplines are more prone to contractual employment than others. Tech, the beloved holy grail of governments and industry, includes a number of professions that tend to be project-based. Building new websites? Changing organizational systems? Modernizing infrastructure? You’re likely to have contract employees at your organization until the changeover is complete. Indeed, there are professional job boards dedicated to contracts and projects in the tech sector to help employers connect with the right people. Non-profits aren’t immune to contracts either. Staffing is one of the biggest items in most non-profit budgets, and since funding often comes from grants, successful project bids, and fundraising, they often hire staff on contracts. These positions may be renewed from one year to the next, as long as funding remains available. This is an opportunity for you to apply your hard-earned research skills to your career. Industry reports, surveys from your professional field, business listings for your geographic region, and LinkedIn can all help you to create a list of potential employers who may pay you for what you want to do. If job security is at the top of your career wishlist, research these organizations to understand their hiring patterns and decide if they would be a good fit for your next position. If the majority of their new hires seem to be contractually limited, you can always move on to another organization on your list. Start by tapping your network for informational interviews to find out how organizations are onboarding new hires. If you don’t yet have contacts in your chosen field, check out your alumni association for people who may work in your profession. You’ll be able to ask your new contact for referrals to others in the field as you go forward with the process, so don’t worry if your network initially seems small. You only need a few people to get started, and insider information can be extremely invaluable in understanding hiring patterns. Your first position outside of academia is not likely to be your dream job. Sometimes it does happen, but not most of the time. If the purpose of your first job is to pay your bills, help you build your skills and network, and demonstrate your professional abilities, then contracts are not necessarily a step backward. After speaking with your industry contacts, you may find that organizations are more willing to hire people on a continuing basis after they have a few years of experience in the field. If that is the case for your profession, then you’ll want to make a plan for your professional development, skill gaps (training), and networking. Contract employees are not usually offered professional development opportunities, so you will need to be responsible for growing your career and learning new skills. Making a plan can help you keep yourself marketable for your next position, and you should always be searching. Writing your plan “in pencil” means that you need to update it and be flexible for different opportunities that come your way in the early years of your career. At the annual Beyond the Professoriate conference this year, I will be discussing the contract aspect of the gig economy, and providing strategies for navigating these uncertain waters. Despite the difficulties that PhDs face in transitioning to careers outside academia, I believe that we are uniquely qualified for addressing the issue of contract employment. Precarity is a staple of our professional culture, and once we understand the challenges, we can develop strategies for overcoming them. 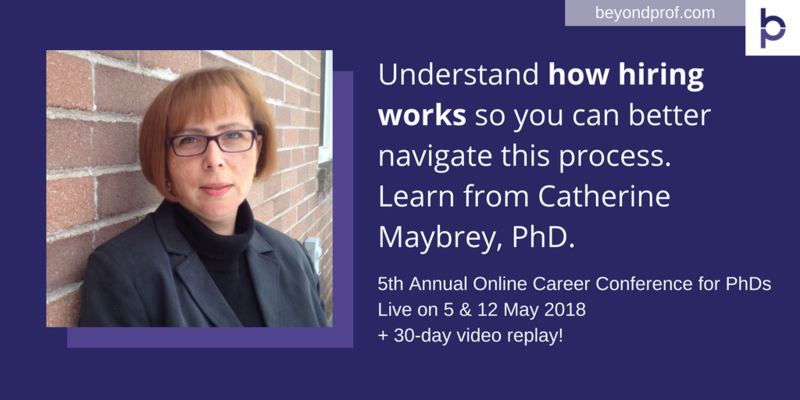 Catherine Maybrey, PhD, will present during the 5th Annual Beyond the Professoriate, the Online Career Conference for PhDs, on May 5, 2018. Ah, lest we forget the PhD-to-Coach track. Just completed my PhD and regret ever doing it. If I could do it all over again, I probably would have gone to trade school. Then, once set up with an income and a means of living, completed a degree on a part-time basis if I felt like it.